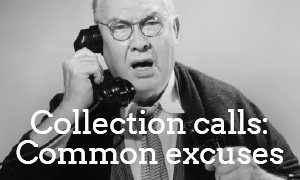 The most common excuses when collecting on past due accounts. Our response: Send a fresh copy of the invoice and request a confirmation and ask the customer to confirm receipt. Also confirm future delivery means by asking for the account manager’s direct email so that this excuse cannot be used again by that customer. Our response: What if you received this as an email reply? Oh-Em-Gee! All kidding aside, ask when the customer anticipates the system being repaired and how the company is arranging for payment in the interim. All business does not stop with a computer service interruption. Our response: This is a frustrating excuse, similar to “our computers are down.” Be persistent and ask about arrangements for payment of other important expenses, like staff wages. And finally, ask when WILL that person be back? Often along with this is the excuse that “one signature is still needed” which is answered by asking that they forward you the check and also contact their bank to authorize that check number to be cleared upon deposit. Our response: Ask for check and postage details (check number, date, and address used.) If they don’t have those details, consider terminating the relationship immediately–the only thing worse than a non-paying customer is a dishonest customer. Our response: Ask “when was the last check run?” And then ask, “What happened to us on that run?” And finally, learn when will the next check run will be. The failure to pay is not acceptable under any circumstance. Your customer contracted for your goods or services and understood that an invoice would follow. When dealing with excuses for non-payment, always remain understanding, ask questions, and (politely) present an option or consequence. Have notes beside you if it helps when you make those calls. In February, we’re offering an easy way for you to let us manage your aging accounts before your company turns them over for collections. We can help you separate yourself from debtors so you can spend time with your most loyal customers. Drop me a line to learn more.